Contoured wool felt saddle pad with comfort grip panels, 32″ x 32″ x 1/2″. This 1/2″ thick heavy 100% wool felt pad is constructed with comfort grip panels allowing for reduced slipping. The wool is breathable and helps absorb moisture and shock on your horse’s back. 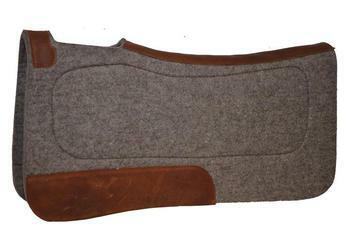 Its contoured design allows for a perfect fit and comfort for your horse. Also includes genuine leather wear leathers. Quality crafted in the USA.